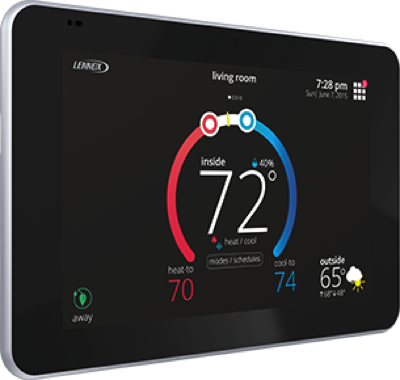 Dalco A/C & Heating Co.
A regular programmable thermostat can’t help you save energy because you have to set your schedule based on what you think it will be. But the smarter, more adaptable iComfort S30 helps you save energy without a second thought. The iComfort S30’s Smart Away mode works with an app on your family’s smart phones, to detect when the house is empty and automatically change the temperature to a more energy-efficient setting. And it detects when a family member is on the way home to return the temperature to its regular setting. So even if your schedule isn’t consistent, your energy savings are. Because the iComfort S30 Smart Thermostat adapts to your life. Perfectly.